If you’ve been to college, or experienced an Ah-Ha! moment, then you might know how it feels to be drained of all enthusiasm after weeks of computer labor – and foot work – and then find a new muse that you can then fuse into your design. Back to my Ah-Ha! moment…check out this Wikipedia link I stumbled upon when just purely thinking about what the Japanese call their bathhouses…surely there be a name I could pronounce. And this stems from my fascination with the constructing of words: etymology. Did you know Chinese is a ‘futureless’ language when it comes to speaking of any thing? Its a rapturing idea when it comes to the power of the minds way of thinking about the future (and outcomes of things) when it relates to how you speak about it. Here’s the talk: Etymology TED TaLK. Press play and listen to all of them on the page. The Sento was a Japanese Bathhouse. It was the type of space both male and female would walk through together. Interacting. Observing. Roaming. Being quiet. Being respectful. Enjoying beauty. 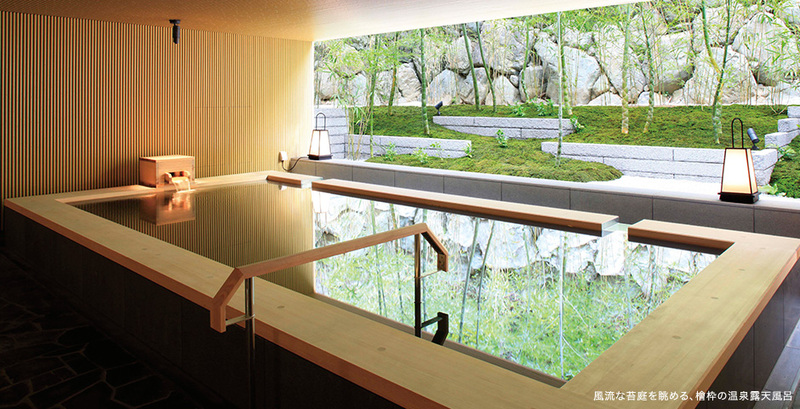 Ahhhh, how much I would give to experience a true Japanese Bath house. Maybe I’ll save for a whole year 🙂 Hunker down. I’m good at that. Anyway, my current and final project as an Interior Design undergraduate (with a Minor in Environment & Society) is to retrofit an 18,000 square foot metropolitan historic building in the heart of East Village, San Diego, California and turn it into Coastal Southern Californian metropolitan destination spa. I have my idea. Which I made into floor plans (construction documents). The renderings are currently being worked on. Toiling on them as much as I can in hopes they come to fruition with my allotted itinerary. Needless to say I have a bit of anxiety. Which is where this idea of Sento popping into my head (due to all things bouncing around in there) comes in. Thank goodness. Thank you little genius. Hope you enjoy the links I’ve provided above. They’re enlightening. That is all. Ciao! I’m a pretty traditional girl. And I have definitely been called an old soul more than a handful of times. So when it comes to looking and feeling healthier there is no better piece of advice that I could give someone than the age-old saying of, “you are what you eat.” In addition to looking and feeling great, my next recommendation would be: get active! But first and foremost, know what you are putting into your body and what it is or isn’t doing to nourish you, and secondly examine your diet and figure out what you might be missing or need more of. Also, time of day is oddly enough, a key factor too. Here are some more tips to feeling and looking great in other ways than just through food: 8 grandma-approved beauty habits to adopt now : TreeHugger.